If you are an accounting professional, you can sign up for the free Wholesale Pricing program and also use QuickBooks Online Accountant for free. If you both create a client’s company and manage the client’s subscription as part of the Wholesale Pricing program, Intuit sends you the bill for the client’s subscription. It is your responsibility to bill the client for the QBO subscription. The bill you receive from Intuit is a single consolidated bill for all the QBO subscriptions you manage. You don’t have to enroll clients as part of the Wholesale Pricing program, but if you do, you might be able to get QBO for your clients at a reduced price. The Wholesale Pricing program is often referred to as the Wholesale Billing program; for this discussion, the two terms are interchangeable. Accounting professionals are automatically signed up for the free Wholesale Billing program when they log in to QBOA for the first time. But, the Wholesale Billing program doesn’t become active until the accounting professional enters billing information into the Billing Profile in QBOA. From the QBOA Client list, click the Gear button located in the top right corner of the page. From the drop-down Gear menu that appears, select Your Account under Your Company. The Your Account page appears. Click the Edit Billing Information button. Fill in all Payment Information fields. The Your Account page reappears, and the Wholesale billing Status will be active. The Your Account page in QBOA. Each month, you receive a bill from Intuit that covers the subscription costs of the clients you add to your Wholesale Billing subscription. You cannot add annually paid QBO subscriptions to the Wholesale Billing program; the QBO subscriptions must be paid monthly. 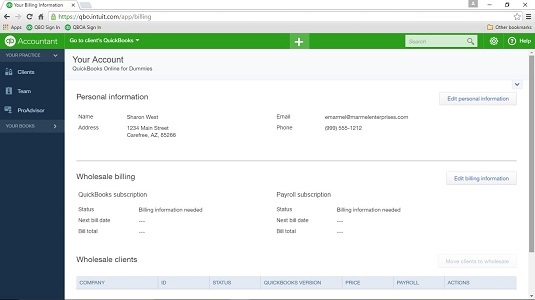 A client QBO Wholesale Billing subscription stays active for as long as you maintain a valid form of payment in the QuickBooks Billing Profile. Wholesale QBO companies do not expire. Click Clients in the Navigation bar. Click the gear in the top right corner of the QBOA toolbar. From the drop-down menu, under Your Company, select Your Account. The Your Account window appears. In the Wholesale Clients section, click the Move Clients to Wholesale button in the Actions column. The Move Clients to Wholesale Billing page appears, displaying only those clients not currently part of your Wholesale Billing subscription. Click the check box beside each client you want to move and click Next. Review your selections and, when you’re satisfied they are correct, click Move Clients. A page appears that identifies clients that migrated correctly and clients whose migration failed.